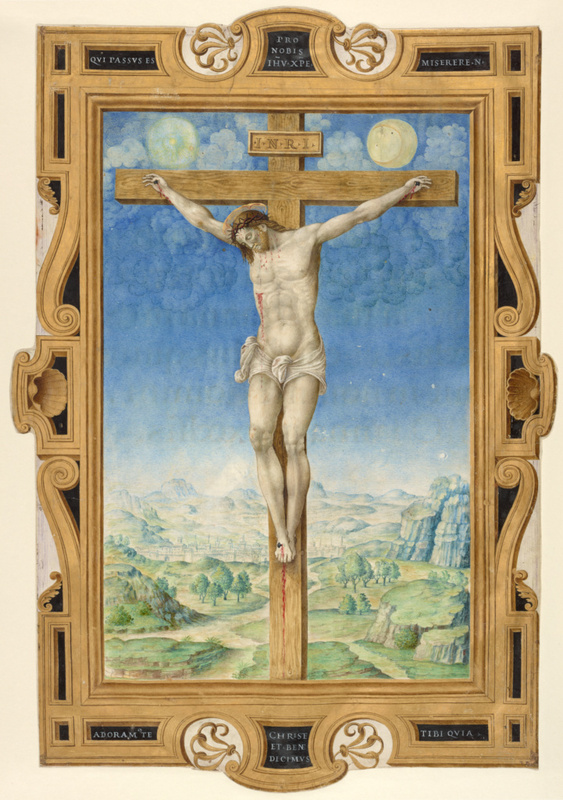 This miniature depicts a monumental crucified Christ, recalling the bulky, heroic male nudes of Michelangelo, against the background of a vast atmospheric landscape and billowing clouds. Inscribed at the top of the frame is a response from the Feast of the Exaltation of the Cross: "You who suffered for us, O Jesus Christ, have pity on us." At the bottom is an antiphon from the same feast: We adore you, Christ, and we bless you because [by your holy cross you have redeemed the world.]" The artist, Vincent Raymond, who was French by origin, worked in Rome for decades. In 1549 he was finally appointed papal illuminator under Paul III. This miniature comes from a missal perhaps made for that pontiff.